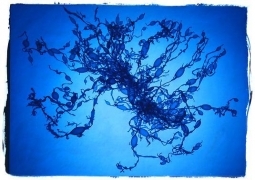 Inspired by the seminal work of one of the pioneers of photography, Anna Atkins, British photographer Nick Veasey has created an intriguing body of work with his cyanotypes of x-rays of seaweed. 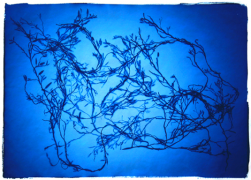 In researching the project, Veasey, who hails from Kent, the same county where Anna Atkins lived and worked, visited her former home and limited himself to the same environmental constraint of using seaweed from only Britain. 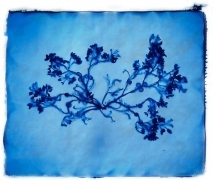 Anna Atkins’ father was a close personal friend of Sir John Hershel and William Henry Fox Talbot, both of whom were instrumental in the invention of photography. 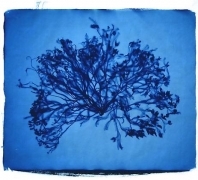 Mrs. Atkins was a keen botanist and combined this passion with Herschel’s new discovery – the blueprint or cyanotype. 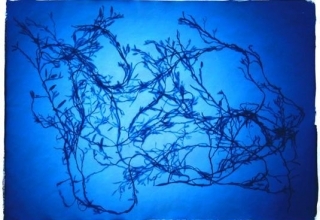 The result of Anna Atkins' endeavors was ‘Photographs of British Algae,’ acclaimed as the world’s first illustrated book. Regarded as one of photography’s most important achievements this masterpiece is held (in varying degrees of completeness) in several of the world’s pre-eminent museums. This body of work explores the relationship between the visible and invisible. The x-rays expose what lays beneath the surface by using a spectrum of light called radiographic photons that are invisible to the human eye. Indeed, because they are invisible, these potentially harmful rays of light compound the danger inherent in radiography. This hazardous stage creates elegantly detailed images of the structure of the seaweed. The next stage uses the light of the sun. The ultraviolet light that makes all things on earth grow, that allows us to see the world around us by reflected light. This natural sunlight passes through the x-ray to make an ethereal cyan blue print. By introducing x-ray to the photographic process, Veasey creates a even more complex form. They are recognizable as seaweed, but are elevated from their fairly unremarkable natural state to multi-layered, intricately detailed pictures that reveal nuances of nature normally hidden from the human eye. Just as Anna Atkins brought together a technically inquisitive mind and a passion for experimentation in the 1840’s, Veasey captures that pioneering spirit. The new works are deferential in their source of inspiration and printing process, but also excitingly fresh and beautiful. Creating art that borrows from the past is a path well trodden, as is the fusion between science and art. 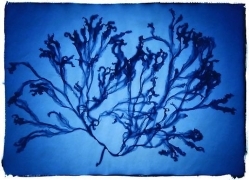 By using different spectrums of light and new and old imaging techniques, Nick Veasey’s cyanotypes of x-rays of seaweed raise many issues when contemplating the results. One of the most vivid messages to come from this body of work is how fascinating and exquisite our world is. As with many of the best things in life, when delving deeper than the superficial, one tends to find true beauty.